Beijing resident, Dong Suxia, 63, has hypertension and coronary disease. Instead of enduring long waits at various hospitals, Dong goes to a community health service center to visit a doctor she signed up with a year ago. "The doctor is patient and gives me detailed advice on a healthy lifestyle. She even calls me to see if I take the medicine correctly. You don't see this in big hospitals," said Dong. 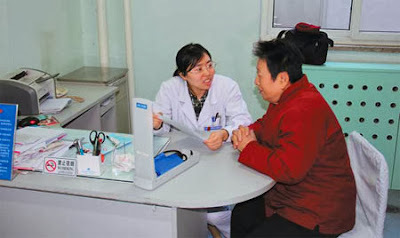 Dong is benefiting from a family doctor plan rolled out in the city in 2011. According to the plan, community health service centers should set up teams consisting of a general practitioner, a nurse and a healthcare assistant, and sign contracts with patients suffering from chronic diseases in the neighborhood. The goal is to channel chronic patients away from overburdened large hospitals and better monitor their condition. Desheng community health service center in Xicheng district, which Dong visits, is one of the first grassroots healthcare providers to sign up patients and has taken a lead in chronic disease management. Desheng center and its seven subcenters have formed 23 family doctor teams, and enrolled 13,800 households with family members suffering from chronic diseases. The neighborhood has 110,000 residents and covers an area of about 4 square kilometers. Han Zhengzheng, director of the center, said: "Residents can choose to sign the contract or not. They can select the doctor they want in the center." Gao Fengjuan, a general practitioner at the center, said she monitors patients as needed to control their health problems in the long term. Gao said her team has signed contracts with more than 200 patients in the neighborhood who have chronic diseases, including coronary disease, hypertension, diabetes, cerebral infarction and joint problems. A contracted patient has an electronic health profile, which keeps track of diagnoses and prescriptions, as well as general health conditions. It's the same doctor for every visit. While doctors offer medications, nurses and healthcare assistants provide lifestyle intervention. Ma Pengtao, a nurse in the center, said blood pressure or blood sugar levels are tested every visit with chronic patients to make sure diet and exercise routines are being followed. A family health profile is also available for patients to provide professional advice for the whole family. Performance levels are determined by how many patients are signed up, and random assessments are carried out. Zong Baoguo, an official of the city's health bureau, said this has a direct effect on the team's salaries. A team is allowed to sign no more than 800 households. "With this limit, the more they sign, the better their performance is, and the more bonuses they get," Zong said. "Our goal is to have community health centers provide better services to more people." According to a decision approved by the Third Plenary Session of the 18th Central Committee of the Communist Party of China in November, municipalities, provinces and regions should ensure that community healthcare workers sign a contract with residents in the neighborhood. In Beijing, according to Zong, every community healthcare service center has family-doctor teams. "There are 3,331 such teams in 324 community healthcare service centers around Beijing. To date, 7.59 million residents have signed a contract with these teams," Zong said. The quick transfer of patients to a nearby top-level hospital also makes Desheng center an attractive option. Using an online system, medical workers can transfer complicated or acute cases directly to the outpatient department of Peking University No 1 Hospital. The patients from grassroots healthcare centers have priority to visit doctors in the hospital, while other people may need to wait days or even weeks if they visit the hospital by themselves, said Han, the director.